The authors show how basic principles—such as protection of the rights of the defence, legal certainty, and proper conduct of the procedure—facilitate the application of the doctrines of effectiveness and non-discrimination to those elements of the national procedure which impede in some manner the effective enforcement of Articles 81 and 82 EC. Their in-depth analysis ranges over procedural aspects of such elements as rules of evidence, costs, expert testimony, injunctions, burden of proof, limitations, and forms of compensation, ultimately leading them to propose clear modifications of certain rules of national procedure that go a long way toward ensuring adequately effective enforcement. Preface. Introduction.Chapter 1. 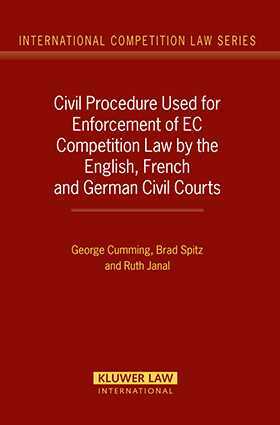 English, French and German Civil Procedure. Chapter 2. English Procedure: Evidence. Chapter 3. English Procedure: Conditional Costs. Chapter 4. English Procedure: Expert Evidence and Assessors. Chapter 5. English Procedure: Disclosure. Chapter 6. English Procedure: Costs. Chapter 7. English Interim Injunctions and Representative Actions. Chapter 8. French Civil Procedure. Chapter 9. French Procedure: Proof and Evidence. Chapter 10. French Procedure: Forms of Compensation and Costs of Actions. Chapter 11. German Procedure: Representative Actions and Binding Effect of Cartel Authorities Decisions. Chapter 12. German Procedure: Evidence and Burden of Proof. Chapter 13. German Procedure Costs and Limitation Periods. Chapter 14. Conclusion.